perClass provides tools for easy deployment of pattern recognition algorithms in products. The corner-stone of the deployment framework is the pipeline object, discussed in Chapter: Pipelines. Pipelines always execute through the perClass Runtime library writen in C. Under Matlab, the execution is routed through the MEX interface. In order to execute the pipeline in a custom application outside Matlab, we need to export it using the sdexport function. This pipeline requires perClass runtime version 4.0 (11-jul-2013) or higher. > sdrun.exe myclassifier.ppl -d " 1 2 "
We have provided sdrun command with the pipeline file and data. It outputs the classifier decision. sdrun is the simplest way to execute the classifiers outside Matlab. In addition to sdrun utility, perClass offers tools for easy embeddedding of classifiers in C/C++ programs or their execution from any environment capable of calling a DLL. The sdrun utility allows execution of perClass classifiers from operating system command line (Windows key+R to open the Run dialog and enter cmd). It is available for each supported platform under interfaces\sdrun directory. Because it's statically linked with the perClass runtime, sdrun utility does not have any external dependencies. It requires only a license file and a pipeline file. The license file is assumed to be located in the same directory as the sdrun executable. sdrun lists the pipeline name, input and output dimensionality and data type and the type of output (soft outputs or decisions). For the decision-returning pipelines, it also provides the list of possible decisions. Note, that in the final product using perClass DLL, the pipelines do not need to be stored as separate files visible to the end-user. Instead, they may be stored in an internal application resource or buffer. Example of loading pipelines from a buffer using C API is given in ex_buffer.c file in SDK directory. sdrun utility may execute the pipeline on a set of observations stored in a comma-separated text file. This option is useful for a quick batch processing. The data file should store individual samples (feature vectors) as comma-separated lists, one row per sample. sdrun utility can be executed on one or few data samples provided directly on the command-line input. Using the -d option, we may specify the string with space-separated feature values. Multiple feature vectors may be separated by semicolons. > sdrun.exe myclassifier.ppl -d "1 2; -4 10; 0 4.55"
license: product="runtime.demo" present=1 exp=30-sep-2017 exp_days=143 issued=9-may-2017 hostid="ANY"
license: product="runtime" present=1 exp=11-may-2017 exp_days=1 issued=8-may-2017 options="CP,imaging" customer="" contract="" hostid="00a3ffa0"
The machine line lists hostid and IP address of current machine. The license line(s) list runtime licenses present with details such as issue-date, options or days to expiration. perClass classifiers may be executed directly in MS Excel worksheet. 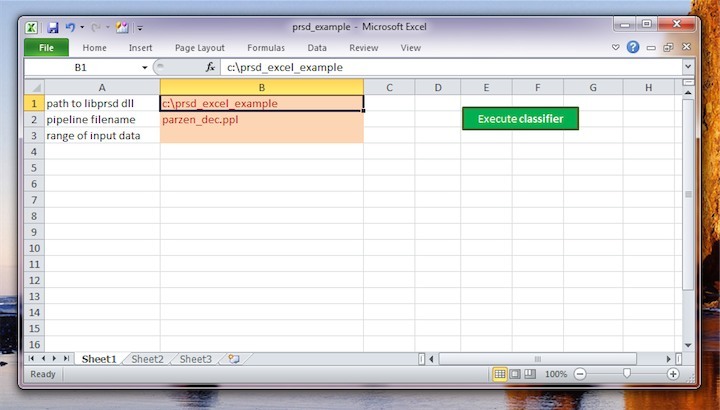 The example for Excel 2010 or higher is provided in the interfaces\Excel\perclass_excel_example directory. 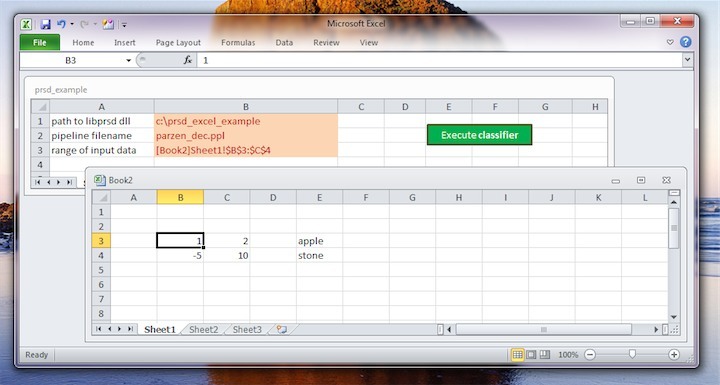 Note: It is important to open the Excel example worksheet perClass_Excel.xlsm from Excel File/Open menu, not by double-clicking on the file icon. The reason is that only then Excel correctly assigns the "default file location" and will find the perclass.dll runtime library. When we open the example worksheet, we can see the three parameters needed for classifier execution on the left and the green execution button on the right. We will first need to specify the path to the example directory in the B1 cell. This helps Excel to locate the perClass.dll library. Second, we need to provide the path to the pipeline file in B2. We may use our own classifier exported using sdexport command or try one of the three pipelines included with the example (fisher.ppl, parzen.ppl and parzen_dec.ppl). Now, we may prepare the input data. We fill the data matrix directly in the worksheet. We must only specify the range of input data in the cell B3. Input data may reside in any other sheet or even in an entirely different workbook. We only need to provide the correct reference in the B3 cell of the perClass_example.xlsm file. This allows us to execute classifiers directly in our spreadsheets, without including any specific code or libraries. 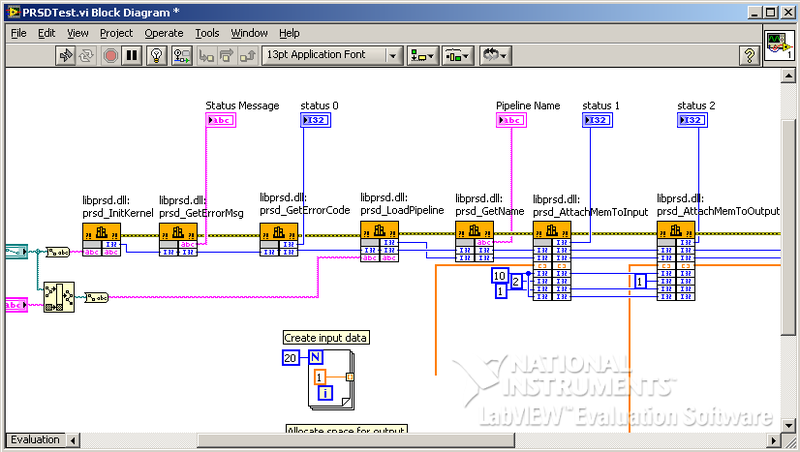 perClass classifiers may be executed from LabView environment using the example interface perClass_example1.vi in interfaces\LabView directory. perClass 3.0 introduces new deployment tool for execution of classifiers from Matlab or Matlab compiler. The MEX library sdrun uses perClass deployment license instead of the perClass toolbox license. Therefore, you may use it to distribute classifiers to third parties. The sdrun MEX is fully self-contained. To embed classifier execution in your Matlab/Matlab compiler application, we only need to provide the sdrun binary, license file and a classifier pipeline. in deployment mode (e.g. in custom applications made with Matlab compiler). The sdrun loads the pipeline and returns the pipeline index. To execute the classifier on new data, simply provide pipeline index and data matrix. The sdrun MEX will return decisions as numerical indices. Complete functionality of perClass execution is available through the C/C++ interface in SDK directory. Runtime API changes slightly with 3.0 release, see this article for details. After that, the pipeline is ready for execution. To process more data, you can write them directly into the input buffer and execute the pipeline again. This example (ex_basic.c) shows a complete application loading a classifier, processing some data and writing out the results. The example assumes that the input data are 2D feature vectors. decisions for new data samples. lines 10-13 define abort mechanism in case of error. It prints error message and releases main perClass runtime structure pk. line 25: To use perClass runtime, the library needs to be initialized using sd_InitKernel function. It checks for the license file. If NULL is passed to it, it searches in current directory (directory where the DLL is located). To pass the license in a string, use sd_InitKernelLicString function instead. line 32 loads the pipeline from file and returns pipeline index pind or SD_ERROR. line 36 prints pipeline name. Note that pind pipeline index is used. All the pipeline-handling functions accept pind and thus allow use of multiple pipelines in one session. lines 45-50 prepare the input data buffer pbin. The buffer of SD_DOUBLE type is allocated on line 50 for 2 samples and the number of features read out from the pipeline. lines 55-58 fill the values into the input buffer. Note that this example uses prbuf object and user-friendly functions to manipulate the data. It is also possible to handle input/output buffers using standard mechanisms such as malloc/free or custom allocators and handle memory through low-level pointer access. line 61: input buffer is attached to the pipeline. lines 68-71 prepare the output buffer pbout. Note, that the output buffer is of SD_INT type as our pipeline produces integer decisions. Prior to perClass 3.0, output were always doubles. lines 84-87 print out the decisions. The sd_GetValueInt Note the conversion from integer decision code to decision name. lines 90-94 release the structures. All buffers allocated by us need to be also freed by us explicitly (even if attached to the pipeline). libPRSD allows switching between multiple pipelines in one session. A call to sd_LoadPipeline returns a pipeline index pind. All functions operating on a pipeline specify the working pipeline using this index. Pipeline may return soft outputs (e.g. probabilities) or decisions. To test if pipeline returns decisions, use sd_getDecCount function. If it returns 0, the pipeline returns soft outputs. For the complete example, see ex_decisions.c file. Pipeline decisions are provided as numerical decision codes that need to be translated into decision name if needed. Decision codes preserve the same values that were used when creating the classifier in Matlab. The classifier returns one of the three decisions, numerically 1=apple, 2=banana, 3=stone. On the line 3, we read the integer pipeline output into res. On the line 5, we print both the numerical decision code res and the corresponding decision name. By default, perClass works with double precision data. Starting with perClass 4.6, it is possible to directly deal with uint8 or uint16 input data buffers such as raw image content. The idea is to add a conversion step, constructed with the sdconvert command. This conversion step will cast the input uint8 or uint16 data into double precision inside the runtime so the rest of the pipeline may stay in double precision. The pipeline p can classify any RGB vector into grass, road or sky classes. However, it requires double precision inputs. As expected, we can see decisions 1,2,3 as our training data became k-NN prototypes in the same order and thus have zero distance to each other. This pipeline requires perClass runtime version 4.6 (29-jun-2015) or higher. The conversion pipeline can directly perform feature selection on input data. This is useful in order to limit pipeline execution to some band or bands in the original image without converting the rest. We may use 'select' option to define feature indices. Note, however, that we must construct a conversion step directly and join pipeline manually. On the side of perClass Runtime API, uint8 and uint16 data types are denoted by SD_UINT8 and SD_UINT16 constants, respectivaly. Identically to the standard double-precision pipelines, there are two ways how you may provide an input buffer to uint8/uint16 pipelines. The first one is to attach uint8 pipeline directly to your existing uint8 memory buffer with sd_AttachMemToInput function. You only need to provide it with a pointer to unsigned char array, casted as void*. Second option is to construct a prbuf buffer object containing uint8 data. If you prefer that perClass runtime allocates the buffer, use the sd_BufNew function with SD_UINT8 or SD_UIN16 as type. Alternatively, you may wrap an existing memory area in your application memory space into a buffer with sd_BufReferrringTo. In both case, the values may be read/stored using sd_BufGetValueUint8 or sd_BufSetValueUint8, respectively (or sd_BufGetValueUint16 and sd_BufSetValueUint16 for uint16 data). For an example, see SDK ex_uint8 example, namely the ex_uint8.m Matlab file exporting a uint8 pipeline file and ex_uint8.c C example executing it on new data. perClass Runtime API provides cross-platform high-precision timer via sd_Tic and sd_Toc functions. The timer returns a double-precision value with elapsed time in seconds. Average speed on 10 rounds of 100000 samples: 16.9 msec. Total thoughput: 5.91 Mega samples/sec. Average speed on 10 rounds of 10000 samples: 54.0 msec. Total thoughput: 185.06 kilo samples/sec.